Nearly every recreational boater and commercial marine operator has benefitted from hydrographic survey data by way of nautical charts, depth guides or maps showing submerged obstacles. Hydrographic data helps to keep vessels safe, but can also guide the strategies of those involved in marine construction, offshore exploration and/or drilling, coastal engineering and zone management, commercial fishing, dredging projects and more. This data is also important for comparison purposes following incidents, such as weather events or marine accidents, that could alter the health, shape, depth and size of waterways. To collect marine data, researchers use specialized hydrographic survey instruments – including multibeam and side-scan sonar, echo sounders, Light Detection and Ranging (LiDAR) radar, Differential Global Positioning System (DGPS) and more – to map a body of water’s depth and size, physical characteristics, the shape and patterns of the coastline and/or floor, and the locations of submerged obstructions. Interestingly, while these hydrological surveys of waterways are highly sophisticated, a conflicting paradox within the industry exists. The sector uses some of the most advanced sonar and positioning equipment, but the collection of data uses manual operations that are both time consuming and monotonous. Across all industries, manual operations add inefficiencies, risk and cost to operations. From agriculture and transportation to mining and construction, advanced automation and robotics are revolutionizing how planned and routine work is done all over the world. Today’s autonomous control technologies – like the Sea Machines 300 workboat system – allow hydrographic surveyors to modernize operations in a way that is proven to increase efficiency and reduce costs, while increasing safety. It also helps surveyors stand out in a sea of competitors, as technological innovation is anticipated to become a future requirement by organizations seeking data collection services, including the National Oceanic and Atmospheric Administration (NOAA). Early adopters of modern, innovative technologies have the most to gain. In addition to the features above, adding a Sea Machines 300 system to hydrographic survey workboats allows an on-board crew to focus on other operations, like data processing/or quality control and provides the option to operate in lower-cost, minimally manned or unmanned configurations. 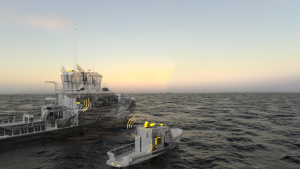 In controlled environments, a remote operator can command a single or multiple autonomous hydrographic survey vessels from a mothership or shore location. This is done with video, radar and AIS, and in some cases, the survey data itself. The Sea Machines 300 system also gives a hydrographic survey ship operator the ability to remotely control onboard payloads, such as survey sonars, hydrophones, winches, cranes and davits. Importantly, the collaborative work feature included in Sea Machines’ autonomous system creates a multiplier effect when surveying large areas. Operators can now coordinate multiple boats to follow the same planned path at set distances apart and collaborate with autonomous capability enables unprecedented surface coverage. 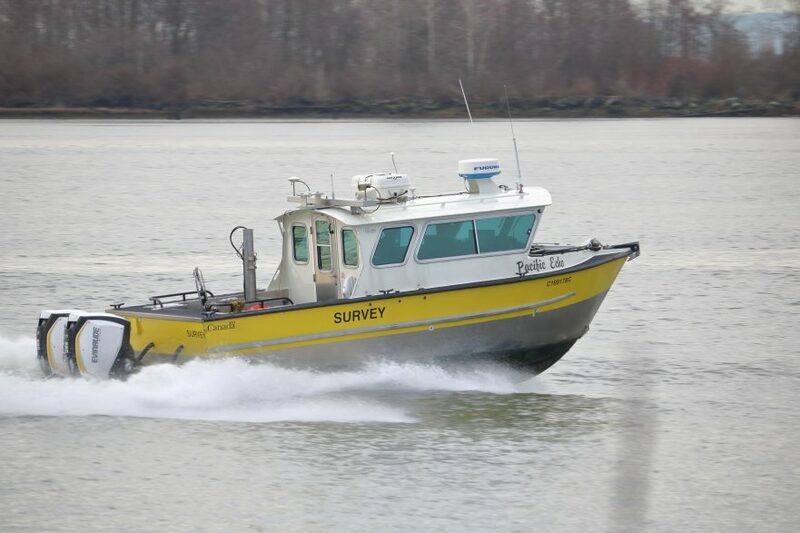 Hydrographic survey operations of all sizes can benefit from autonomous vessel technology. Whether a surveyor’s operations include two boats, or larger ships with daughter craft, adding a Sea Machines autonomous control system to commercial vessels is simple. The technology can be added to existing assets as a retrofit or as part of new-build packages, requiring only 10 components to install. Most vessels can be outfitted with a custom Sea Machines system in just a couple days. Even for small hydrographic survey businesses, the system is surprisingly accessible, thanks to an affordable price point or flexible leasing options. Sea Machines is also actively seeking new partnerships with forward-thinking hydrographic survey contractors that have an interest in participating in pilot programs that will continually improve our technology while decreasing operational costs. These early adopters can benefit from special pricing and other incentives. It’s time to recalibrate the hydrographic survey industry with marine robotics. Sea Machines is proud to be navigating the way, thanks to its autonomous systems purpose-built for the marine industry. If you’re ready to modernize your hydrographic survey operations, contact us today.